Last year’s popular ‘Hogwarts After Dark’ events will return to Warner Bros. Studio Tour London – The Making of Harry Potter this year! They invite brave witches, wizards and Muggles to attend a magical Hallowe’en evening in the Great Hall. The ‘Hogwarts after Dark’ events will take place on 26th, 27th and 28th October from 7:30pm until midnight and are open to over 18s only. Tickets are priced at £240pp and will go on sale on Tuesday 28th August at 10am at www.wbstudiotour.co.uk/after-dark. Photos from previous events can be seen in the gallery. A free cloakroom is available, and this will be open for guests on the night. A complimentary shuttle bus will be running to the event at approx. 6:50pm from Watford Junction and return services will leave the Studio Tour throughout the evening. Following last year’s incredibly popular ‘Hogwarts After Dark’ events, Warner Bros. Studio Tour London is once again inviting brave witches, wizards and Muggles to enjoy a magical Hallowe’en evening on the set of the Hogwarts Great Hall on 26th-28th October. Guests attending ‘Hogwarts after Dark’ will begin their magical evening with smoking dry ice cocktails and canapés before stepping onto the red carpet through the doors of the wizarding school into the Great Hall, which will be completely transformed for Hallowe’en. 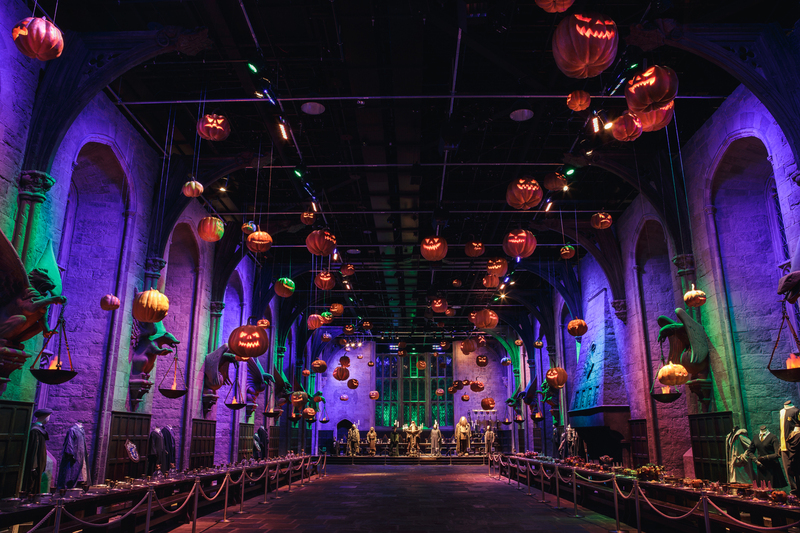 The Great Hall will be decorated with over 100 floating pumpkins, as seen on screen in Harry Potter and the Philosopher’s Stone while the long tables will be laden with a Hallowe’en feast of red apples, pumpkins and cauldrons of lollipops. After stepping into the actual Great Hall set that was used for filming, guests will enjoy a delicious two-course dinner and drinks surrounded by the original props and costumes. All before grabbing a lantern and following the spiders into the newly opened Forbidden Forest where dessert will be served in the company of magical creatures such as Buckbeak the Hippogriff and Aragog the Acromantula. Throughout the evening, Death Eaters will be roaming the Tour dressed in the original costumes from the film series allowing guests to see up close the intricate details of the embroidered robes and hand-painted masks. After dinner, guests are invited to explore the Studio Tour after hours, admiring sets such as the Gryffindor common room and the Weasley’s kitchen from The Burrow, before meeting members of the Prop Making Department who will be revealing the filmmaking secrets behind the ceiling full of enchanted pumpkins.